I truly think I need more brunch in my life. Brunch to me is symbolic of many things – specifically sleeping in and clinking glasses of Mimosas, Bellini’s and Bloody Mary’s with the #GirlSquad. What a fantastic way to start a (lazy) Sunday, amirite? Now – I’ve noticed that more people opt for going out to brunch and less people offer to host it themselves. I’m sure this has everything to do with the fact that Sunday is chalked up as being a low key day and no one wants to burden themselves. But it got me thinking: if I did host brunch, what types of things could I offer? I’m very much used to hosting dinner parties – but brunch could be fun! After today’s run in my laboratory (kitchen), I might have to start planning for this. I absolutely fell in love with this dish and, best of all, it’s presented in a cast iron skillet. (See my post on Caring for Cast Iron and Why it’s the Best.) This particular recipe is meant for one, but it’s easy enough to adapt in order to serve a few of your chums. After being cubed, the sweet potatoes are tossed in a bit of olive oil, smoked paprika, chili powder, kosher salt, and cracked black pepper. The tomato sauce adds some awesome sweetness and the poached egg adds silky to the already saucy. It’s really just glorious all around. This skillet is packed with fiber, potassium, and vitamin B6. The addition of the poached egg and cottage cheese (or plain Greek yogurt, if cottage cheese ain’t your thang) gives you a nice punch of protein, too! The highest of fives to a colorful and unique breakfast-meets-lunch that is nutritious, substantial, and takes less than 30 minutes from beginning to finish. Peel the sweet potato and cube it into 1/2-inch cubes. Place the cubed sweet potatoes in a bowl and drizzle with olive oil; season with the dry seasonings and toss until evenly coated. Transfer the sweet potatoes into the skillet. Add the tomato sauce and the rinsed black beans. Place in the oven, uncovered, for 20 minutes or until sweet potato is tender with the poke of a fork. While the potatoes bake, you can prep your garnishes and poach your egg. See notes for egg poaching tips. Once the sweet potatoes are tender and ready, remove from oven and set aside. Place avocado on top of the potatoes in addition to the poached egg, cottage cheese to yogurt, and garnishes. EQUIPMENT: If you're doubling+ this recipe, you can use a regular sized cast iron skillet. !POACHING EGGBring a pot of water to a gentle but steady simmer (not a rolling boil). Add a teaspoon of vinegar to the water. Crack each egg into it's own ramekin or a small cup. With a spoon, create a gentle whirlpool in the water. This will help the egg white wrap around the yolk. Slowly tip the egg into the whirlpool, white first. Let to cook for three minutes. Set the egg onto a paper towel and gently pat dry. I am a huge fan of sweet potatoes! Breakfast in one skillet? And with beans and eggs too!! I"m there!! Cant wait to make this! Back at it again with another delicious cast-iron creation! I'm practically drooling on my keyboard as I type this... it looks incredible and your photos are stunning. That egg on top is so appetizing! Just pinned it and can't wait to try it soon... possibly over a mimosa! Cheers! 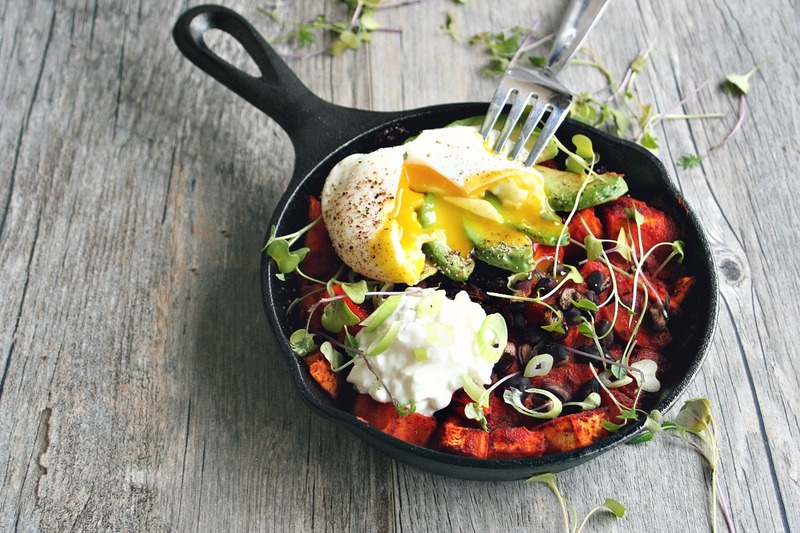 I am a big fan of one-skillet breakfasts - this looks fabulous! Bookmarked! Thanks, Mardi! Let me know if you try it; I hope you love it. This looks amazing and it's making me hungry for it right now. I love the whole flavour combo, especially the smoked paprika. Thanks for the great idea! Thanks, Colleen! I'm glad you're into this idea. I made this recipe up as I went along, so when the result was as delicious as it was, I was REALLY stoked and eager to share it. I hope you try it and love it! This looks wonderful! My husband doesn't like the fattiness of traditional brunch foods such as bacon and sausage anymore. This would be a wonderful, healthy alternative for us, so I've pinned it to try! That egg!! Love the way it cuddles the avocado :) A great gluten-free breakfast! Thanks, Elaine! I'm a real sucker for poached eggs. They add such a nice creaminess. And you're right, gluten-free! What a gorgeous dish, Dana! I know I'm funny, but I usually have breakfast within 5 to 10 minutes after I woke up, so for me brunch is more of a lunch where I can indulge in more of my favorite sweet breakfast items among other savory food ;-) . This would be perfect for me, I love the look and the flavors! Pinned!